Who knows where the notion came from? Regardless of whether it was a rumor passed along by a friend or heard on the street, the truth of the matter is this: You’ve mistaken a plumbing misconception (or quite a few) for a plumbing fact. By doing this, you’ve inadvertently put your plumbing system, your budget and your peace of mind at risk for catastrophe. Thankfully, our team at Ray The Plumber flushed out the truth behind the most dangerous myths our customers have believed. Don’t you dare. You see, when it comes to garbage disposals, many people believe that as long as the faucet water is running, anything goes. But, truth be told, there are things that just don’t belong in a garbage disposal—no matter what. A clogged drain is a major pain. But don’t mistake a “miracle in a bottle” for a solution. All over-the-counter liquid drain cleaning products do is buy you time in between clogs. Plus, they create more problems by damaging your pipes and having an adverse effect on the environment. So, if you want to send your worries down the drain for good, you need to deal with the real issue by turning to Ray The Plumber. 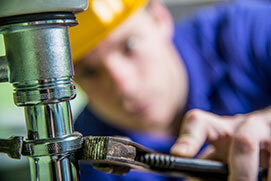 Here’s how our team can help you get a handle on your plumbing. When you’re facing a clog, there’s only one liquid drain cleaner we trust and that’s Zoom Drain Bio [Link to Zoom Drain Bio Product page]. This natural alternative to caustic drain cleaning chemicals creates free-flowing drains without using harsh chemicals. This makes it the safe choice for people, pipes and pets. But Zoom Drain Bio is more than a drain cleaner. It’s a probiotic for your plumbing. That’s because it eliminates buildups and keeps them away for an entire month. In fact, one bottle of this product is equivalent to 32 treatments of proactive protection for your drain line, septic and pipes. Actually, nothing could be further from the truth. A drip is actually a big drop. In fact, when it comes to leaky fixtures, one drip of water per second drops 2,082 gallons of water a year! Once a drip starts, it won’t stop on its own. And, the longer you let it drip, the more money you’ll waste paying higher water bills. But that’s not all. Over time, this leak will stain and then wear out your plumbing fixture, leaving you with no choice but to replace it, which is a lot more money than a repair. But that’s not all. As you know, water shortages are a very big problem in countries across the world. Well, according to the Environmental Protection Agency, household leaks can waste more than 1 trillion gallons nationwide every year. That’s equivalent to the annual household water use of more than 11 million homes. By addressing a leak quickly, you’re saving money with lower water bills and doing your part to help conserve our world’s water supply. Are the plumbing fixtures in your home working? Or are they working because you’re making them work? For example, if your toilet flushes but you need to jiggle the handle after to stop the water from running, then watch out. This minor inconvenience may actually be a sign that there’s a major issue with your plumbing system. Your home’s plumbing is a very delicate system. In fact, even a minor issue can throw your whole system out of whack. So, don’t wait for a problem to arise to give your plumbing the care and attention it needs. Instead, schedule preventive maintenance [Link to preventive maintenance page] today to flush away costly repairs, move toward lower energy costs, conserve water for future generations and tap into a home that flows in the same direction as your budget—rather than against it. Honesty Is Our Policy—Now That’s the Truth! Our commitment to our customers is almost too good to be true. Experience it for yourself by filling out our online form or calling us at 1.877.CALL.RAY today!